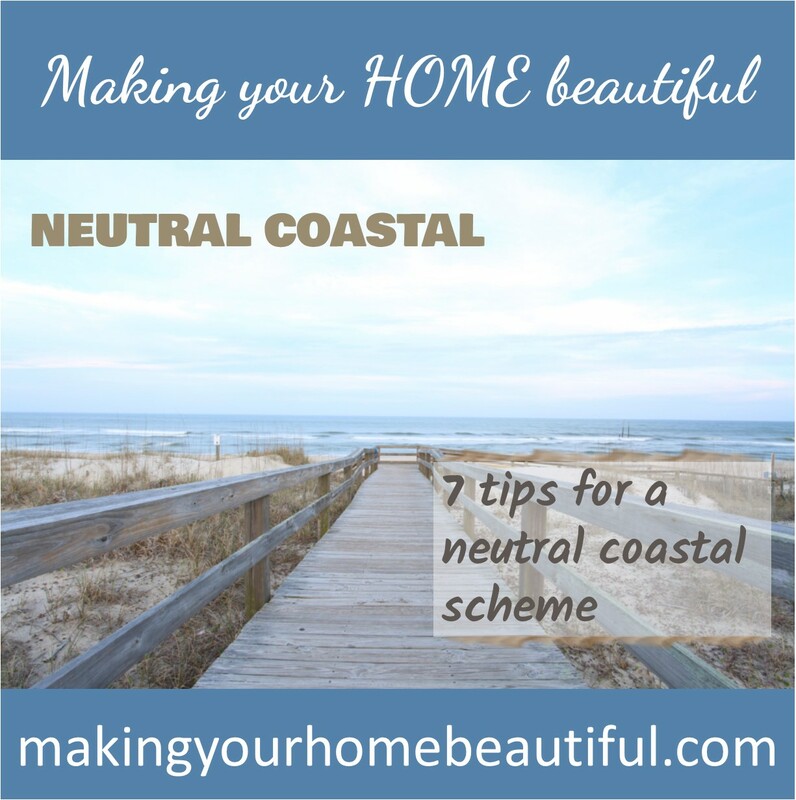 The post 7 Tips for a Neutral Beachside Scheme appeared first on Making your HOME beautiful. 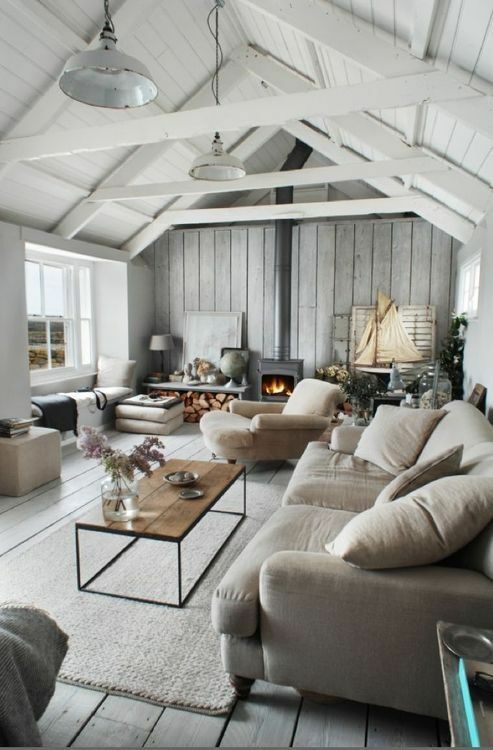 One of my favourite coastal looks is a neutral beachside scheme. We are so conditioned to associate coastal style with the colour blue that we often don’t consider using anything else for this look. Although blue is a favourite colour for the majority of us, in fact Pantone say 70%, we may not necessarily want to use it in our homes. People often feel obliged though when they live by the magnificence of the ocean to throw in a splash of predictable blue but you can achieve a wonderful relaxed coastal vibe without touching the colour. 1) Look to the beach for inspiration. Take a walk along the sand and take careful note of the local colours at your beach. The colours in far north Queensland will look quite different to a beach in Sydney and of course a beach in the south of England will most likely be covered in pebbles! It is always a good idea to use local inspiration so that your house fits into the area. For example, there’s nothing worse than seeing a house of bluestone in an area that is built on sandstone, so think about what is local to you and will therefore naturally work. 2) On your walk, pick up some driftwood, shells, pebbles, sand and rock and look at the beautiful natural palette that you have put together. You will have a wonderful array of whites, greys, soft browns and warm sandy tones from which to choose and you haven’t even glanced at the ocean! 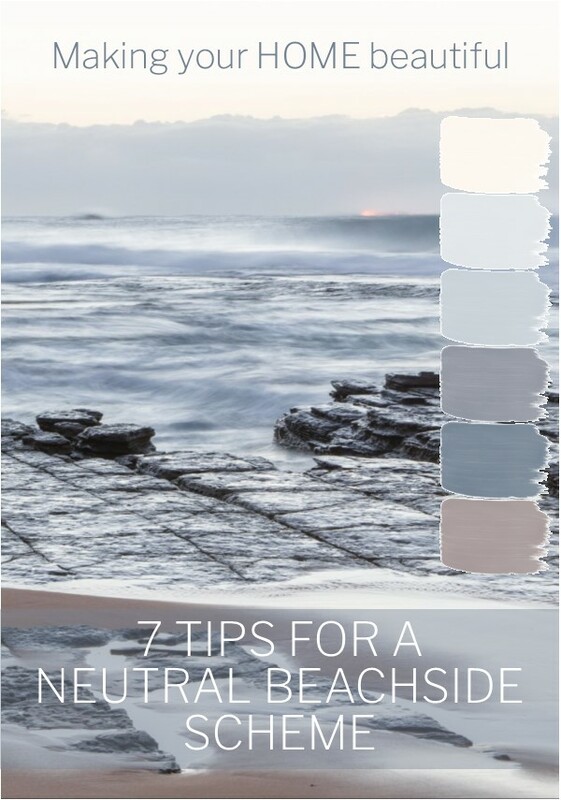 3) A colour palette for a beachside scheme should start with an off white or neutral for the walls to keep the look light and airy. Grab some paint chips from your local hardware store and lay them out with your inspirational pieces. (Remember that in some areas you can’t take shells etc. from the beach so you may need to rely on photographs). Look at the pieces from your walk that really attracted you. Was it the soft greys of weathered driftwood, the mix of white and grey from pebbles or the crisp white of a shell? Use these to match your wall colour. 4) As lovely as all white schemes can be, they can become too one dimensional. Remember that a coastal look should be laid back and relaxed with nothing too perfect so it is a good idea to introduce some tonal variation with warm greys and natural linens. 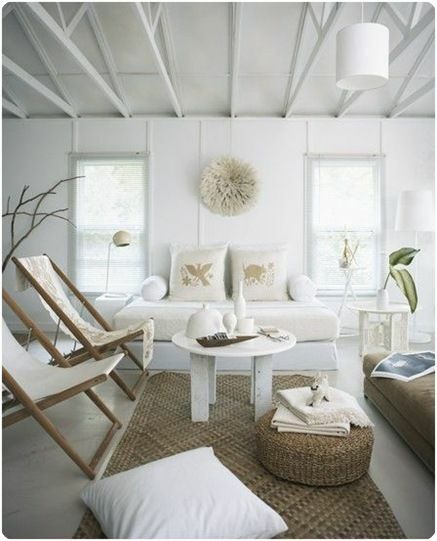 So again, look to your beach inspiration and match fabric and rug samples to the pieces you found. 5) To keep the relation to the beach, consider the textures that you use in addition to the colours. Look again at your inspiration and you will see that natural pieces from the beach have been eroded over time and have wonderful matt and rough surfaces. 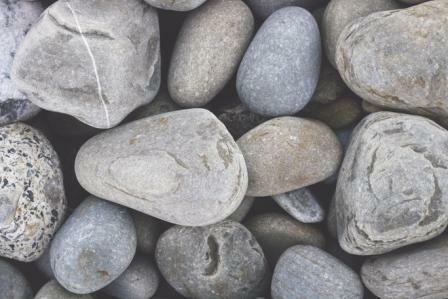 Even a pebble that has been worn by centuries of waves and is beautifully smooth, will not be shiny. So ditch the polished glass, granite and metal surfaces and opt for natural matt finishes for furniture and accessories. 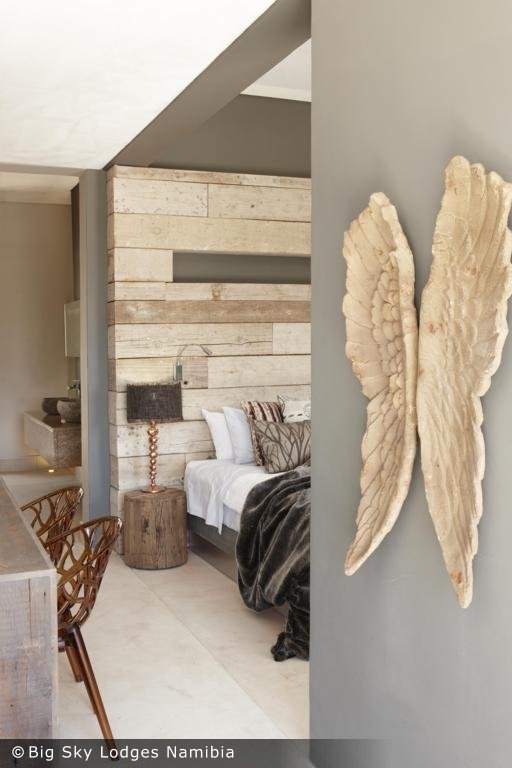 6) Weathered, aged timber is really on trend at the moment for lining walls. So take advantage of this wonderful trend as a way to add interest and beautiful rough texture to your coastal scheme. 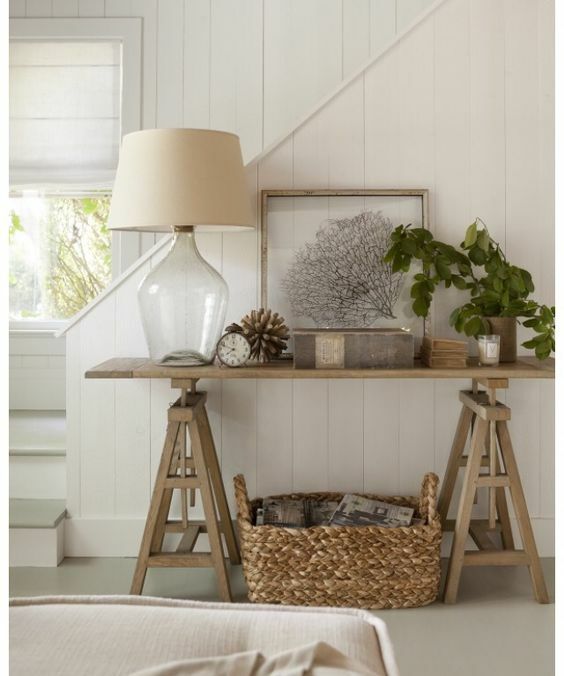 7) A perfectly styled vignette that evokes the beach will be a wonderful reminder of where you are. Get creative and fill jars with pebbles, make lamps from driftwood and use local stone for a paperweight. These finishing touches really evoke the beach and will complete a beautiful neutral coastal look. Here is a palette that I have put together from a gorgeous coastal photograph. Remember that even the ocean is often grey and white too! Using this palette as a guideline you have a fresh white for the walls and woodwork or a soft grey with white trim. Darker smoky blue/greys for the sofas/rugs or the sandy brown neutral could be used. I would love to hear how you decorate for a coastal look. 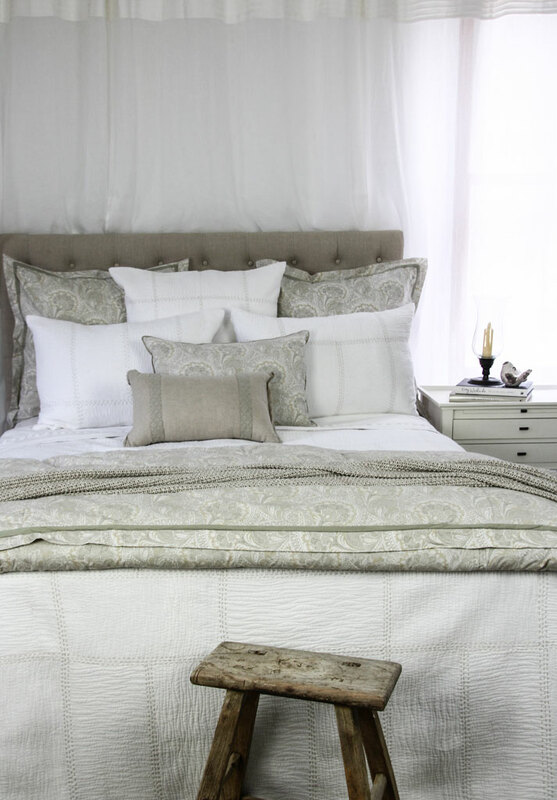 Do you love using neutrals for a scheme like this? Please feel free to comment and also to follow my Pinterest board on Coastal Neutral Schemes for lots of inspiration, now and in the future. Enjoy!